All freedom loving South Africans of whatever faith will have been shocked by the latest hateful utterances of the leader of the Economic Freedom Fighters, Julius Malema. Speaking in Newcastle, KwaZuluNatal, yesterday (7 November 2016), Malema included these words in an emotionally charged address to his followers: “We are not calling for the slaughtering of white people – at least for now”. Such language, and indeed a lot of his divisive address yesterday, has no place in a free democracy. It has no place in our beloved country which our former archbishop, Desmond Tutu, so rightly dubbed “the rainbow nation” when we celebrated our liberation from our institutional racist past in 1994. Malema is on record as saying that he may not be a churchgoer, but he believes in Jesus Christ and God. Like Mr Malema, I also believe in Jesus Christ and God. I too, like him, am black. But unlike him, it seems, I know that in Christ there is no east or west, no north or south, but one great fellowship of love. Malema’s vitriolic attack on his fellow white South Africans is sad and a stark reminder that the naked sin of racism is alive and well in South Africa. It is a reminder that racism is as damaging whether articulated by black or white and is no different to the corruption and greed of many in our country – all of which is decaying our land right now. It is particularly shameful to see it manifest in a person such as Malema. Christians can have no truck with this hateful, anti-Christian rhetoric. All South Africans can trace the history of their lives to the influence of many people, from different races, various Creeds and backgrounds. None of us exists in a vacuum, for all of us are made in the image of God and are dependent on the community of the faiths to which we each belong. The manner in which Jesus Christ carried out his ministry, reaching out to minorities and the marginalised in his day, tells us that true liberation entails an acceptance of everyone, irrespective of our cultures, our history or the baggage we bring that may tempt us to hate. The apostle, Paul, emphasises this with great clarity: “…there is no longer Greek and Jew, circumcised and uncircumcised, barbarian, Scythian, slave and free…” (Colossians 3:11). The hateful and hurtful words that assailed us yesterday vividly contradict the spirit of love with which this country overflowed in the 1990s, and subsequently during the soccer World Cup in 2010. It is such a spirit that is needed now more than ever. 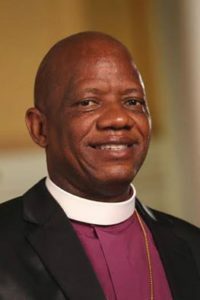 My call on all South Africans, and in particular those living in the economic hub of our land where I have been called to be bishop, is to show that love to one another. It is to move away from short-term, selfish goals that alienate us all as people who have shown in the past that we can live in a spirit of reconciliation and love for the greater good of all.